Engineering design seeks the best possible solution within a specified set of physical, economic, environmental and competitive constraints. Although creating a bill of materials is often an after-thought to engineering design, the product BOM can be the key to monitoring the product development process. As an example, PDXpert PLM software can help engineers (and their managers) predict whether a product will meet its targets by totaling the cost, mass and material composition of a multi-level bill of materials. In order to efficiently manage a product's bill of materials, a product lifecycle management (PLM) application starts by providing a set of part attributes that includes product costs, item mass, and the materials that make up the part. PDXpert PLM software permits engineers and designers to track two costs per part: a budget or target cost, and another cost which reflects the current supplier forecast or actual purchase cost. In addition, PDXpert also lets users specify the total mass of a part. Many industries carefully monitor product mass (think aircraft, automobiles and sports equipment), and being able to track this information lets designers make appropriate trade-offs between expensive, but very lightweight materials, and lower-cost but heavier components. While part mass is sometimes specified in response to a marketing requirement, a part's constituent materials are often the subject of regulatory constraints. 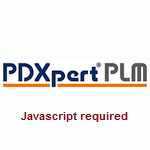 PDXpert PLM software provides the capability to conveniently list all materials of interest within a part. Each material in the list is specified as a percentage of the total part mass (or ppm or ppb, as appropriate), and PDXpert can track materials that are regulated (e.g., lead or asbestos), have end-of-life recovery value (gold, platinum), or represent less attractive recycling properties (polypropylene versus high-density polyethylene). The product bill of materials establishes a parent-child relationship between an assembly and its component items. This relationship includes the part quantity required (for instance, 3 units), as well as its unit of measure (such as "each" or "grams"). Beyond this, the child row may also define reference designators to match schematic drawings and layouts, or notes that describe an aspect of the item assembly process. The collection of part attributes is treated within the product BOM as a single object, which can be applied to any number of assemblies. This is in contrast to general-purpose office tools, such as Excel, which require a copy-and-paste of each part attribute into the single-level BOM. While creating a single-level spreadsheet BOM is both time-consuming and prone to clerical error, in almost all cases multi-level cost, mass or material aggregations are impractical. As users add items to the bill of materials, PDXpert PLM software tracks the quantity and unit of measure of each item, and converts each row into the system default units. For instance, a part cost in Japanese Yen will be multiplied by the quantity used by the assembly, and this cost will be included in the total assembly cost in, say, Euros. Similarly, the part total mass will be multiplied by the quantity, and added to the product weight. Each material used by a part will be separately calculated to provide the sum of all materials used for the complete assembly. As individual parts are added to subassemblies, which in turn are assigned to higher-level assemblies, the product structure becomes increasingly useful. Not only can users navigate the bill of materials to view a part's attached drawings or list of approved suppliers, but the cost, mass and materials of each part can be converted to the system default units, aggregated and then compared to the product goals and constraints. PDXpert PLM software provides reports that calculate the total cost, mass, and sum of each identified material for all parts in a multi-level bill of materials. These reports can be run even while the assembly and its components are being defined, thereby allowing product refinements and resource allocations prior to design release. As each subassembly's cost (or mass or material) is calculated, engineers can assess how to allocate their budget. Part substitutions can be easily dragged and dropped onto the structure, and a revised roll-up report can be run in a matter of minutes. Changing an individual part's attributes, such as changing the part mass and cost by using a different material, is immediately reflected in all instances of that part across the entire product. PDXpert PLM software will automatically assign document and part numbers according to your specified rules; precisely locate exact matches and possible alternate parts using free-form text searches; and has a "where used" to show what assemblies use the item, where it appears as a source, and what changes have affected it. PDXpert PLM software keeps you informed of part and document release status and life cycle, and simplifies your work by automatically displaying, on released bills of materials, each child item's current revision. To get learn more, view our video presentation PDXpert PLM Features: Bill of Materials management. Then download PDXpert PLM software to see the full benefits of a simple, flexible, and secure PLM solution.